Design your own ceramic door knob to match your interior decor. The Ceramic Store offer a specialised service from the latest technology of producing any digital photograph or image onto a ceramic door knob made exclusively for you. Send us your design or photo with at least 300 dpi resolution by email to enquiries@theceramicstore.co.uk in .jpg, .psd (photoshop) or .eps (Illustrator) format and we will do the rest. Alternatively send us your photo or design by post and we will scan in at the required resolution and return your photo or design with the finished product. We will produce a ceramic transfer which is then applied by hand to the porcelain knobs and fired in our kiln at very high temperatures to ensure a hardwearing permanent finish. 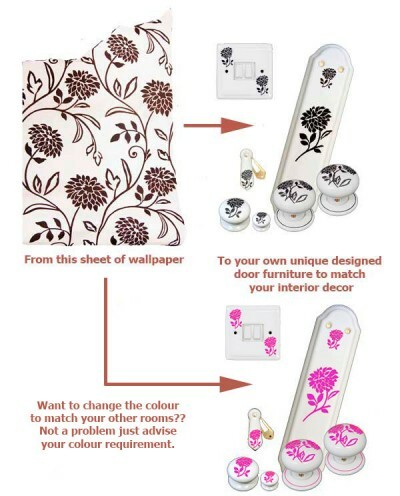 See example photos below of previous personalised ceramic door knob designs we have produced. The above 3 designs are a small selection of ceramic door knob patterns produced specially for a publicly sited artwork at ‘Greenfield`s community housing H.Q’ Essex. With credit to Artist Sarah Sabin for designing and supplying the artwork. Please Note: Pantone colours can vary slightly in the ceramics industry.